· The standard feed rollers furnished on all new WEINIG moulders are the steel-tooth rollers. · These conical-shaped rollers are a patented Weinig design made specifically to properly through-feed most dry materials. For superior gripping power, the teeth on the contact surface are located at an angle, with a maximum "tooth-mark" indentation of only 3mm (1/8") deep. 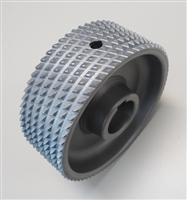 The contact surface of the roller is hard-chromed to provide longer roller life. If less penetration is required, an alternative are steel knurled rollers. These roller are designed with small diamond-shaped points on the contact surface, with a maximum "tooth mark" indentation of less than 1mm (1/32") deep. As with the standard rollers, the contact surface is hard-chromed for long life. 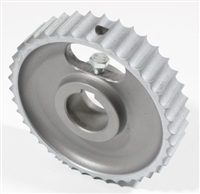 For wet timber or difficult feeding, a very aggressive tooth pattern available only in 2" wide rollers is listed after the other types of feed wheels.